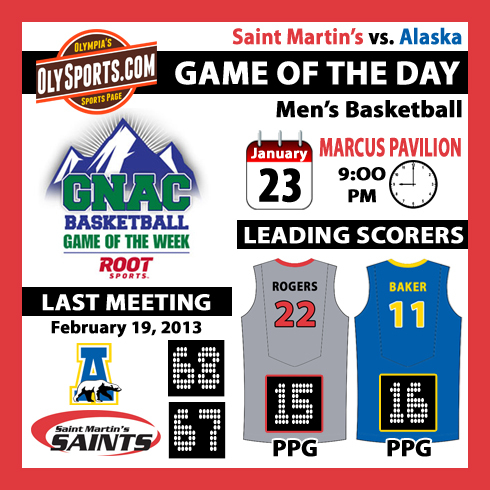 The Saint Martin’s men take on Alaska tonight at Marcus Pavilion in a GNAC battle that will be shown live on ROOT Sports at 9:00 PM. With an alumni rally planned for 7:00 at the Worthington Center and a student tailgate beginning at 7:30 at the TUB behind the pavilion, buzz around campus is extremely high and the atmosphere for the game will be great. And it is quite the bargain. Individual general admission tickets are $6 for adults and are buy one get one free at the door. The Pack the Pavilion night is also a white out and fans are encouraged to wear white. The Saints come into the game at 3-4 in the GNAC with road wins over Simon Fraser and Western Oregon and an upset of Seattle Pacific in their last home game in early January. The Saints play a four guard offense most of the time and junior Ryan Rogers leads the way with 15.1 points per game with senior Evan Coulter just behind him at 14.1 ppg. Redshirt freshman Isaac Bianchini has scored in double digits in each of the last three games with 15, 18 and 14 points mostly coming from behind the three point line. He is 15-of-26 from behind the arc during that time. Alaska is one of the biggest surprises of the GNAC season so far sitting in second place at 5-2. The Nanooks of Fairbanks have four players scoring in double-digits led by senior guard Ronnie Baker’s 16 points per game. 6-11 senior center Sergej Pucar is a load in the paint averaging 13.5 ppg and senior forward Andrew Kelly pulls down a team leading 8.2 rebounds per game and adds 11.8 points. If you are unable to make it to Marcus Pavilion, the game can be seen live on ROOT Sports immediately following the BYU/Portland West Coast Conference game. If you don’t get Root Sports, you can watch the webcast with me, Brandon Sparks, on the call by clicking here. Posted on January 23, 2014, in Basketball, Black Hills HS, College, High school, Saint Martin's University. Bookmark the permalink. Leave a comment.